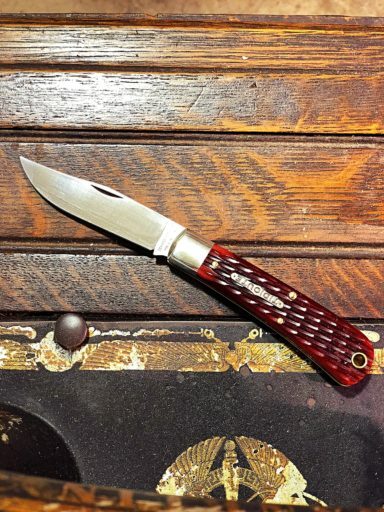 This is the Great Eastern Cutlery Tidioute Oregon Trapper Hunter, has Rust Red Jigged Bone handles and Brass liners. The blade steel is 1095 and finish is Satin. Just an absolutely beautiful knife. Top notch fit and finish. 5 out of 5	Big, classy cutter. If you want a knife that can handle heavy cutting duties but still look like a lot of class, this is for you. Workmanship is precise and to my eye pretty much flawless, works really smooth but has solid snappy action with a half-stop. I like jigged bone for its grippy feel, but this red bone is gorgeous, with just a bit of that translucent look that you get sometimes with that material. Brass-lined lanyard hole dresses the look up nicely, as it should with a knife at this level of quality. Have not sharpened it yet as it is unnecessary, it cuts beautifully straight out of the tube. Profile is not that thick, fits comfortably in the pocket when inside the Tuscan pocket slip. A+++++! I just love it! it is everything i want in a knife. And it’s a PPP!!! And fast delivery.Regular ground 4 Days. incredable! I really love this knife. 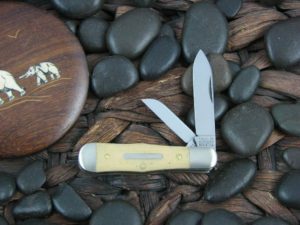 It is my first jigged bone GEC knife. Fit and finish is superb. Keep up the good work. I Love this knife! 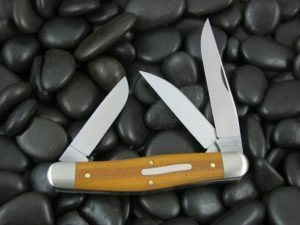 The fit and finish is really nice like all GEC knives. Opens much easier than the BullNose but is just the right size for pocket carry for me anyway. Love the big clip point blade and can be pinched open. I think this ones a keeper! 5 out of 5	Hand-ey knife! First, I was a little let down by the rust red bone, but that was because it came after the Frontier Bone model. The Frontier Bone was (to me) so much more visually interesting, plus the handles were more chunky, giving it a great hand feel. But, its beautiful red bone, with great depth of color, and if you were to carry it in the pocket, it would fit better than the Frontier Bone. And it is (for me) a size I could still carry in a pocket. In the hand, it feels great, and using it feels very natural. Initially, I felt the pull was a bit light, but after using it for a few days, it seems as if the pull has become a bit more firm. I credit this to the joint being maybe a trifle tight, and then breaking in. I may have read somebody else saying this, and it seems to be true. Fit and finish is the usual, nearly perfect! Taking the plunge and sharpening it, it took a very nice edge! This knife reminds me a little of “comfort food”. Its something you feel right at home with as soon as you use it. 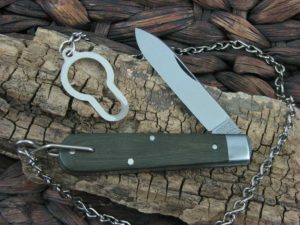 This is a working blade knife. This knife can handle most anything you need from a knife yet it’s still a beautiful knife. The quality and look puts it in the catagory of collector and pretty to look at too. This knife is a great pattern. I like the pull as it seems a little on the lighter side but just right for me. I don’t like hurting my nails as some in my collection do. I’m glad I got this one and a few others in the pattern. Thanks GEC and CK! This is one of the best GEC I have gotten in the last few months. 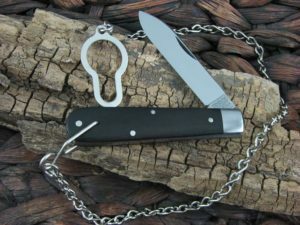 The size is perfect to carry in my belt sheath. Perfectly balanced in hand and as always great fit and finish. Thanks for the quick shipping. Cant wait for the camel bone! Very happy with this knife. To me the rust red jigged bone is the best looking of 43 run. I’m very pleased with the size of the knife as it is very functional for a lot tasks. Great fit & finish. Pull is a little light at around a 5 1/2 I would say. Better than expected walk & talk and the knife came very sharp from the factory.